David Maialetti's photos of the "Wheel Women" roller-skating gals in the Nov. 11 Daily News were awarded second place for sport features in the 2006 World Press Photo Contest. Josh Marshall - "The Bush administration spent $1.4 billion in taxpayer dollars on 137 contracts with advertising agencies over the past two-and-a-half years, according to a Government Accountability Office report released by House Democrats Monday." Guardian (UK) - "Bush administration requests $75m to mount biggest ever propaganda campaign against Tehran government." Congressman John Conyers - "Republicans Block Investigation of Domestic Spying Program"
LA Times - A U.N. inquiry says the treatment of detainees at Guantanamo Bay at times amounts to torture and violates international law. The flat track Minnesota RollerGirls roll up I94 for an exhibition bout in St. Cloud, MN on Sunday, February 19th. 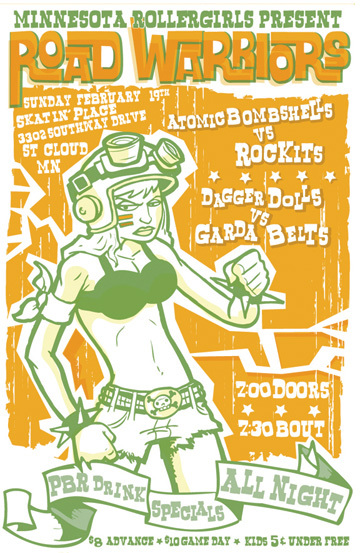 The Atomic Bombshells vs. the Rockits. The Garda Belts take on the Dagger Dolls. The Detroit Derby Girls will skate their inaugural bout This Saturday, February 18th. 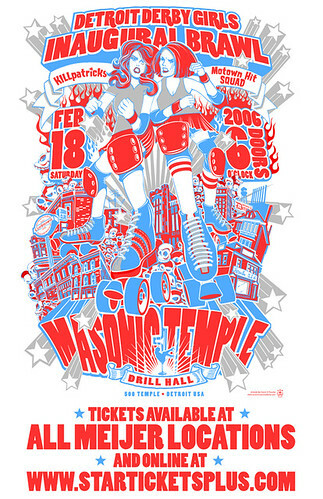 Masonic Temple Drill Hall, 500 Temple, Detroit, MI. Please visit the Detroit Roller Derby website for more info.